Lately you’ve probably heard the terms “Power Analysis” or “Power Data” thrown around. TrainingPeaks will be publishing daily race analyses from each stage of the USA Pro Challenge at trainingpeaks.com/USAPCC, where we’ll take the power, heart rate, and GPS data from the pros and make sense of it all for the public. But you don’t have to own any fancy devices to be able to understand power analysis – here’s a quick introduction to the basics that will start you on your way. You may have heard the term “Watt” used to refer to how much power a professional rider generated within a race. Watts are the common measurement used by cyclists to quantify how much work they performed within a race or training session. Much like how a light bulb consumes 100 watts of energy, a rider can also produce 100 Watts (or more) of energy. All else being equal, the more watts you put out, the faster you go, and the more wattage you can put out, the stronger it means you are. Cyclists measure their wattage output using a device called a power meter on their bike. This power data can be tracked and analyzed over time. A power meter will measure how hard you press against the pedals and how fast you are pedalling to determine your watts you are producing. 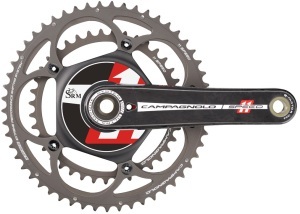 You can think of a power meter as if you hooked up your bike to a lamp. The harder you pedal, the brighter the lamp becomes. A professional rider can easily keep three 100W light bulbs lit for more than an hour. In cycling terms, we would say he averaged 300W for that hour. So, why do we bother to measure watts as opposed to just looking at speed or elevation gain? A great analogy is that of a person who attends their local gym to do a weight workout. Most people would never perform a bench press or any other type of weight lifting without knowing how much weight they lifted. The measurement of pounds lifted is an objective way of knowing how much work you performed, and how to gauge your progress towards a goal. Further, knowing the number of sets or reps you did is meaningless without knowing how much weight you lifted. Similarly, your average speed on a bike on its own is also meaningless. Terrain, body weight, and even weather conditions affect speed – power is an absolute measurement. The concept of power-to-weight ratio is best explained using the example the same engine in two different vehicles. Imagine you take two engines of the same horsepower, and place them within two different cars. Putting the engine in a lightweight sports car will go faster than the same engine placed within a heavy truck or SUV. Professional riders are constantly trying to improve the engine under their hood (their power output), while at the same time making their frame (body weight) smaller. Power-to-weight for a rider is usually expressed as watts per kilogram of body weight (w/kg). The higher the watts, or lower the kg of weight, the faster the rider will go. You may also start to hear the terms “threshold heart rate” and “threshold power”, or “functional threshold power (FTP)”. All of these terms essentially refer to a way of measuring the effort a rider can sustain, going 100% or 60 minutes. Speed isn’t a good reference because it is affected by courses and conditions. Power is the gold-standard method of measuring intensity, and your threshold power (FTP) is often the basic metric used to judge your overall cycling fitness. Therefore most professional riders can tell you exactly what their threshold power value is. They have developed a very good sense of pacing and they know if they remain near their threshold power for too long they will have no choice but to ease up in order to recover. Threshold can be measured using heart rate as well, using beats per minute (bpm), but heart rate is only a measurement of what the body did in response to the input (pedalling at a certain watts). Therefore heart rate isn’t a direct measurement of the work being performed. Heart rate can also fluctuate day to day and be very dependent upon diet, fatigue levels, quality of sleep and even environmental conditions such as temperature, altitude and humidity. Now that you’re armed with a basic understanding of power analysis, you can head over to our daily power analyses of the Pro Challenge on trainingpeaks.com/USAPCC. Stage analyses start Tuesday morning, but until then check out our pre-race predictions for each stage, as well as our explanation of what it takes to win the USA Pro Challenge.